Posting a little lookbook collection this Valentine's Day. Nothing in particular to do with Valentine's, unless you count that my pictures below were all taken by girls... #Galentine's Day. One of the 3 spots below is near my new office; make a guess which! Speaking of which, all the pieces below were kindly sponsored by Le Contour, an online boutique based in Australia that provides free worldwide shipping. They have lots of designs suited for work, but that can also be casual when worn differently! For myself, I paired all 3 pieces with sneakers. This is the Ribbed Bodycon Dress in Black & I love classic designs like these. Wear it with heels, accessorise a little & you're good to go for the night! This Stretch Knit Bodycon Dress in Dark Green is so, so comfortable. Definitely suitable for work without looking too corporate! And last but not least, the Sleeveless Flare Dress in Royal Blue! Went for something a little girlier for my last pick & I like that it's more feminine with the subtle flare & waist panels. This is perfect for Sunday Brunch, which is exactly what I wore it out for! 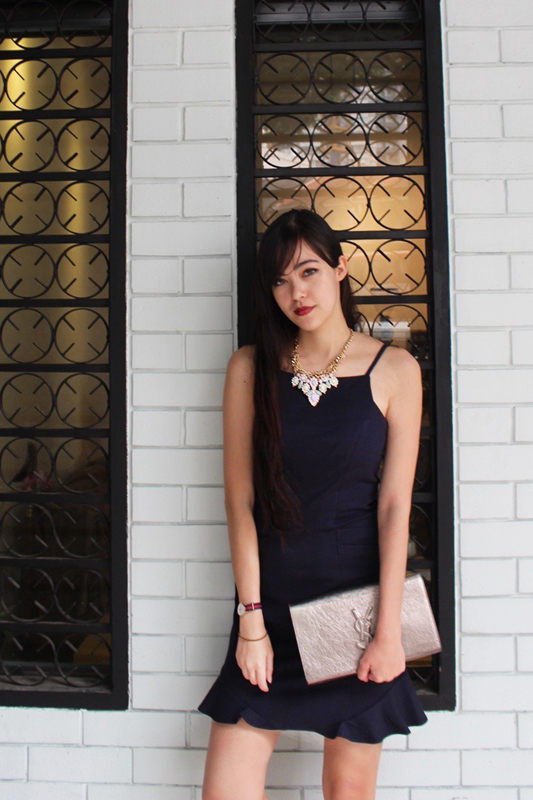 I was honestly pleasantly surprised by the fit & quality of the dresses from Le Contour. Pieces from online stores sometimes can be ill-fitting on me as I'm not your usual petite Asian girl - I'm about 15cm taller & 10kg heavier! And many such stores simply cater a "one size fits all". But browsing their site I realised they even have categories like "Curves Creation" & "Top Balancing". Shopping online often means you don't quite get the fit right, or it just somehow hangs awkwardly off you due to bad cutting & design. The Le Contour pieces were genuinely well-made, of good material & with cutting suited for actual bodies. A definite thumbs up & I look forward to more designs from them! 1 comment on "14 FEB // V DAY"